Hello and welcome to another episode of Raise Your Standards. With Amonkhet only a few weeks away, Standard is in sort of a lull period. As such, I’d like to use this week as an opportunity to take a look at the new mechanics that are being introduced or brought back in Amonkhet. We’ll also take a look at some of the cards that have been revealed and begin figuring out where they belong in Standard. First, let’s talk about a returning mechanic, Cycling. Cycling is an ability that has been used many times during Magic’s long history. For those unaware of what it does, let’s take a look at the Buy-A-Box promo that has been revealed, Archfiend of Ifnir. Cycling is a very useful mechanic that is mainly seen on cards with a high converted mana cost. It allows you to, for the low price of 2 mana, discard the card from your hand and to draw a new card. This works well in situations where you might not have enough ways to produce the mana needed to cast the card, as you can discard the card and draw a different card, hopefully a land card or a card with a lower converted mana cost. It also allows you to get specific cards into your graveyard, which can help trigger Delirium or can enable those cards to be played in alternate ways such as casting them with Torrential Gearhulk or Goblin Dark-Dwellers, or reanimating them with Raise Dead. Now, assuming you have enough mana to play the Archfiend of Ifnir, this has the potential to be a very powerful card in Standard. If your deck has other cards with cycling or madness, you can quickly decimate your opponent’s battlefield. I have hopes that this card can be a big contender in black-based control decks. The next mechanic I’d like to discuss is Embalm. 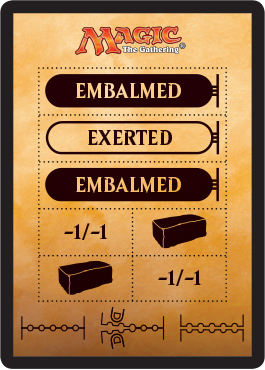 Embalm is an activated ability that can be used on cards while they are in the graveyard. Once you pay the embalm cost, exile the creature card and put a token copy of that creature onto the battlefield that has the same stats and abilities, but is white instead of its original color and is also a zombie in addition to its other types. It also has a 0 converted mana cost. Embalm is a great way to continually have creatures on your battlefield. Play the creature for its mana cost. Block with it and let it die, or sacrifice it for some sort of value. Then embalm it and use it again. This effect works nicely alongside cards like Pious Evangel or Zulaport Cutthroat, where you gain an advantage for creatures entering the battlefield or dying. 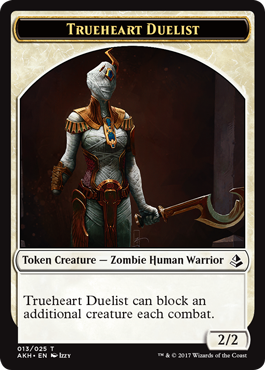 The example of a creature with embalm that Wizards of the Coast provides is the card Trueheart Duelist and it’s associated token. 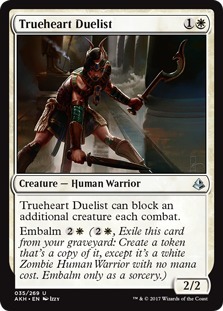 Trueheart Duelist only has a 2 toughness, so using its ability to block an additional creature will likely kill it. However, being able to block your opponent’s two best creatures for two turns could be game changing. And if you’re somehow able to increase Trueheart Duelist’s power and toughness, the ability to block an additional creature might not be so lethal for this card. Our next ability is exert. Exert abilities are additional bonuses that happen when a creature attacks. As a payment for the additional bonus, the creature that exerted cannot untap during your next untap step. The card Wizards provided as an example of a creature with exert has a very powerful ability indeed. It’s called Glorybringer. As you can see, Glorybringer can completely ruin your opponent’s plans for blocking your creatures. Since this has haste, you can cast it and attack with it in the same turn, and if your opponent has a creature that you want to get rid of, you can exert that same turn to deal four points of damage to that creature. 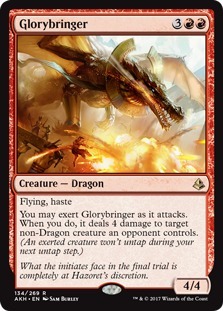 Whether that destroys a creature your opponent was hoping to block with, or deals damage to a larger creature (like a 5/5) your opponent has in play that makes them reconsider blocking, it’s a real combat changer. Exert looks like a mechanic I’ll really enjoy. I’m looking forward to finding a way to give my creatures with exert vigilance somehow, so I can exert every turn with no drawback. Another thing that Wizards showed off this week is the new punch card that will be found in booster packs. Here’s what that looks like. As you can see, this new punch card will be perforated so it can easily be torn apart to provide players with -1/-1 counters, counters to mark which creatures have been exerted, and counters to show which creatures have been embalmed in the even that you don’t have the appropriate token to represent this. There’s also brick counters which can be used on Oracle’s Vault (and possibly other cards as well). I’m not sure if the punch card will be a new feature found in all upcoming Magic sets or not, but I think it’s pretty neat. Next, let’s take a look at the first card that was spoiled from Amonkhet, Dusk // Dawn. I’ll be the first to admit, when I first saw this card, I didn’t like the layout of it. But as time has passed and I have considered things more, I’ve come to like this layout quite a bit. It’s very functional, and I can appreciate that. When the card is in your hand, there’s no need to turn it sideways to read it like split cards of the past. The only ability that can be used is the ability that can be read easily (the Dusk portion of the card). 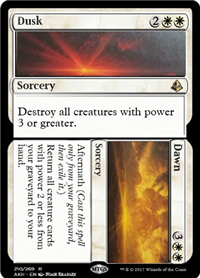 Once the card hits your graveyard, simply turn the card sideways so that the Dawn portion of the card sticks out and can be read easily. It’s very functional which I appreciate. I do agree with the art enthusiasts, though. The art does get lost on this card since it’s so small, which is a shame. The last cards I’d like to look at today are the two new Planeswalker cards from the planeswalker decks. They are Gideon, Martial Paragon and Liliana, Death Wielder. 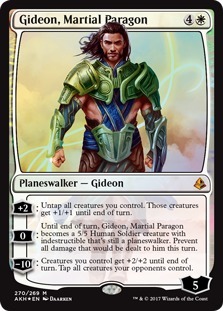 If all had gone according to plan, this Gideon, along with the version of Gideon that can be found in booster packs, would have been the only Gideon’s in Standard. However since Wizards of the Coast reversed their decision to have individual blocks rotate out of Standard twice a year, we’re stuck having Gideon, Ally of Zendikar in Standard for one more block, giving us three versions of him. Will either of Amonkhet‘s Gideon’s be able to supplant Gideon, Ally of Zendikar in Standard? Only time will tell. That’s all I have time for this week. Thank you for taking this journey to Amonkhet with me as we reviewed some of the new cards and mechanics. Official spoilers begin on April 3rd, so this is a very exciting time. What is your favorite new (or returning) mechanic? What do you think of the new cards that have been spoiled? Let me know by leaving a comment below. And be sure to join me again next week for another episode of Raise Your Standards. Until then, enjoy the beginning of spoiler season. Amonkhet, Mike Likes, MTG, MTGDecktechs, Raise Your Standards, Standard, Wizards of the Coast. Bookmark.